Explore the Lennox heat pumps from the biggest manufacturers of the HVAC equipment in North America. Whether you get the entry-level Merit series or the top of the line Dave Lennox Signature heat pumps, you are getting a quality component to your HVAC system that will deliver years of the reliable service. 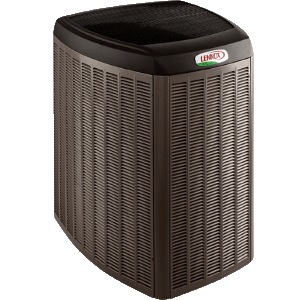 Lennox manufacturer provides you with excellent heating and cooling all year and come in a variety of sizes and price ranges, so you are bound to find something right for you. Lennox has been in business for over 120 years, and they have been perfecting HVAC systems for residential and business applications ever since. Most of the Lennox heat pumps are Energy Star certified, and some have earned best of the year awards for their energy efficiency. The Lennox heat pumps are electric but you can match them with other Lennox products to get duel-fuel capabilities that can save you significantly over just using electricity alone when heating your home in cold conditions. Lennox uses a durable galvanized steel exterior with louvers to shield the coils from rain, snow, sleet, or anything else that might come their way. Some of the Signature models even come with composite fans to keep from collecting snow, so your heat pump will continue to run on the coldest days. All of Lennox’s heat pumps utilize chlorine-free R-410A coolant so they are not adding to ozone depletion. Lennox was actually one of the first to adopt the use of R-410A, putting them at the forefront of realizing the impact industries have on the environment. Control all of your Lennox components with the iComfort programmable thermostat and get perfect comfort from all of your heating and cooling products. Warranties on Lennox heat pumps range from five to ten years, depending on the model. The shorter warranties can be extended with a purchased warranty, but they are still not the best in the business. The heat pumps from Merit series rely on single stage scroll compressors so while they still operate efficiently, they are not as quiet as the upper end models and they also stay on more versus boosting power when the demand increases. They have relatively small footprints, around 30” square, so they don’t take up much space. In the Elite line of Lennox heat pumps, you have a choice of variable speed or two speed scroll compressors. Variable speed heat pump models constantly adjust temperature settings based on both outdoor and indoor temperatures. Two speed compressors, on the other hand, run at a constant lower setting, and then boost the performance when the demand rises. SmartHinge louvers allow technicians easy access to the interior from any side, so it’s faster for them to complete their repairs and get you back in business. Plus, faster repairs mean lower labor costs, so your repair bill is less, too. Many heat pumps in this line come with sound dampening appointments that help ensure that all you hear is quiet. This line of Lennox heat pumps features some of the best and most high tech ones in the industry. You can pair the heat pumps with SunSource solar panels that will start to generate power as soon as they go live, and might even let you give power back to the electric company, zeroing out your energy bills. Special SilentComfort fans and insulation give you effective protection of the fans as well as reduced noise, giving the Signature Series some of the lowest decibel ratings in the industry. Plus the IntelliFrost defroster will keep the heat pump fan from being buried in the snow. These heat pumps feature the Quantum Coil aluminum condenser that gives you the top heat disbursement of any on the market today. The absolute best heat pump you can get from Lennox, and one of the top heat pumps available from any manufacturer, is the XP25. This heat pump is capable of 23.5 SEER cooling ratio and 10.2 HSPF heating ratio thanks to a variable capacity compressor that makes tiny adjustments constantly, so your home stays within .5 degrees of the thermostat’s setting, and you stay comfortable in any weather conditions. The Lennox line of heat pumps is tops at heating and cooling, no matter where you live. They are key components of a full HVAC system and with the Dave Lennox Signature collection giving you some of the best choices possible, you’ll find you can’t go wrong with a Lennox.